Le souk - these little piggies went to the market! OTCB was invited to Le Souk. All items were provided free of charge on behalf of Le Souk. Always on the lookout to try something new, and maybe get a flashback of some previous #otcbontour meals, we (Amanda, Nathan and Mirko) were all excited when we were asked to come and try Le Souk's menu, and wasted no time in organising a lunch time visit. Le Souk or ‘the Market’ in French/Arabic, serves Algerian cuisine and retails a range of unique spice blends, preserves and condiments. Azou (owner) first sat us down on the bench stools surrounding the cooking and coffee area, so you've got plenty to watch over lunch. I (Nathan) was instantly taken back to many breakfasts enjoyed at the Boqueria market of Barcelona. I had always thought that the Adelaide Central Markets lacked the 'eat in' element from the Boqueria markets, but now it has it. The first item that we are recommended is their fresh mint tea, to sip on while we decide what to eat. What comes with the tea is the very special presentation, as the video shows below. This method of pouring the tea is not only fun to watch, it also oxygenates the tea for greater flavour, and also takes a little of the heat out, making it easier to drink when delivered. There are little roasted pine nuts in there too (roasted 7 times to release the oils), giving the tea a nuttiness that balances well with the sweet mint tea. Delicious and refreshing - and we couldn't get enough! So, with an abundance of menu choices all sounding as inviting as the next, we took Azou's lead and tried the Chakchouka, a Merguez Baguette and a Salad Couscous. Each has its own little story, which the owner was happy to tell us all about along the way. 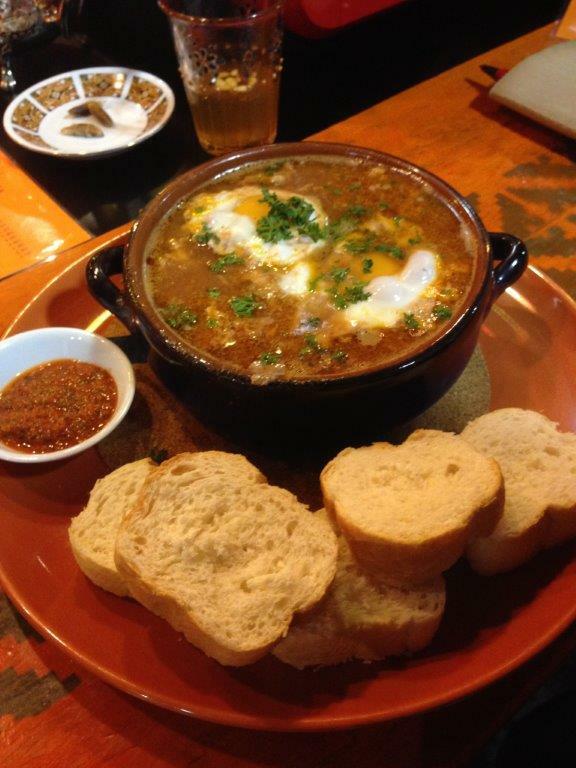 The Chakchouka is minced beef, onion, garlic, tomato and poached egg in Le Souk special spice blend, served with bread. It's the Algerian version of a favourite Italian breakfast, Eggs in Nap Sauce. It's rich and spicy, with the beef flavours balancing the garlic and tomato. The egg was poached as per expected, and we were able to break the yolk and spread it through the sauce. I was a big fan of this, as I like big breakfasts with lots of meat. Mirko and Amanda felt that this was a little too much for breakfast. I was happy enough to take the remaining bread and finish the meal off. Good to share with a few....or alone. Up next was the Baguette. 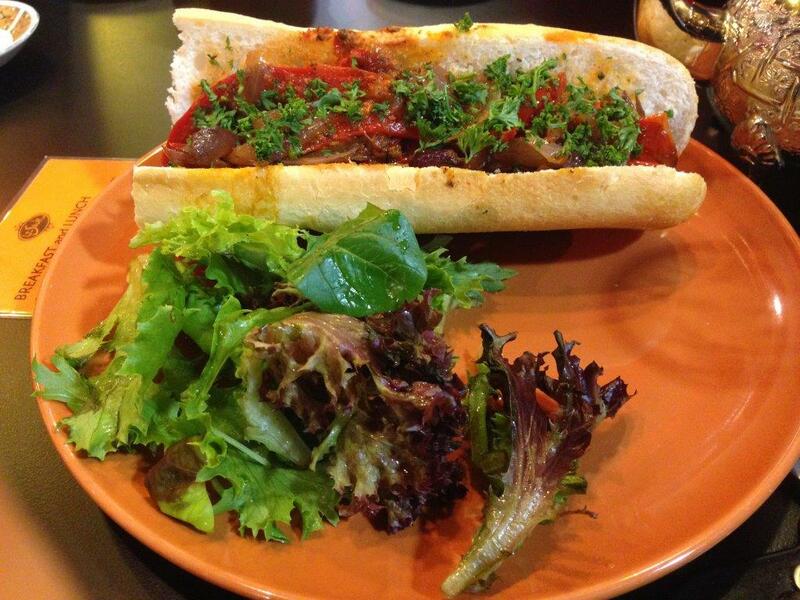 Merguez Baguette is Merguez spicy sausages on a baguette with sautéed red capsicum, red onions and Harissa. We are informed that the baguettes are made in house, fresh daily. The spicy sausage is a family recipe that again, is made especially for Le Souk. Lots of positives, and clearly lots of care is taken with the ingredients. We split the baguette up and the three of us are very happy with this choice. Decent spice in the sausage, complimented well by the capsicum, onions and smoky Harissa. The baguette is soft on the inside, slightly chewy and has a crunchy top. 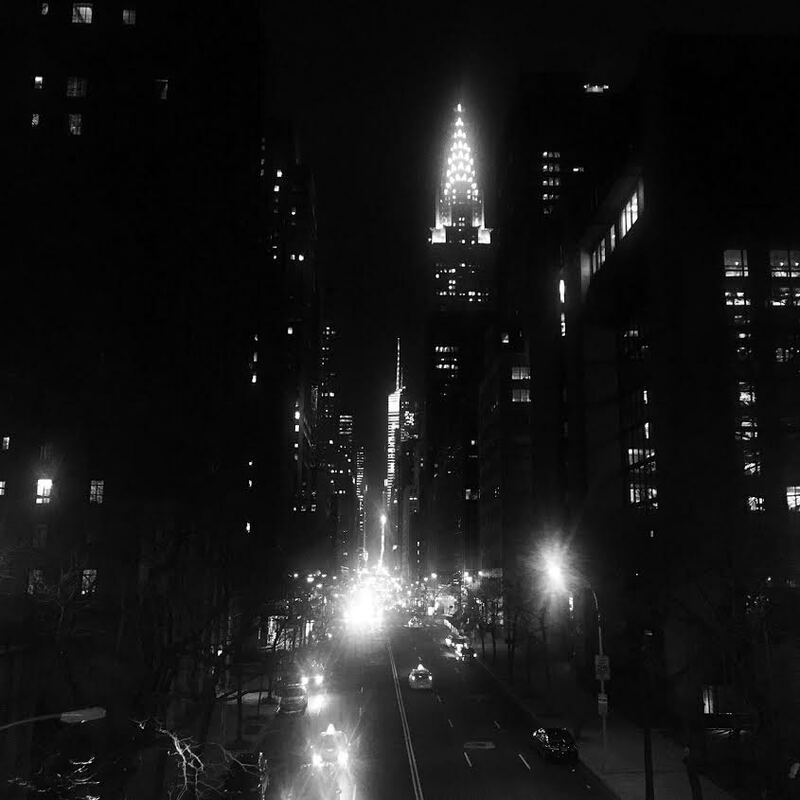 Everything we expected it to be. A lunch option we all agreed we would return for. Served at the same time as the Baguette was the Salad Couscous. This is described as warm couscous served with house-made broad bean and chickpea salads. 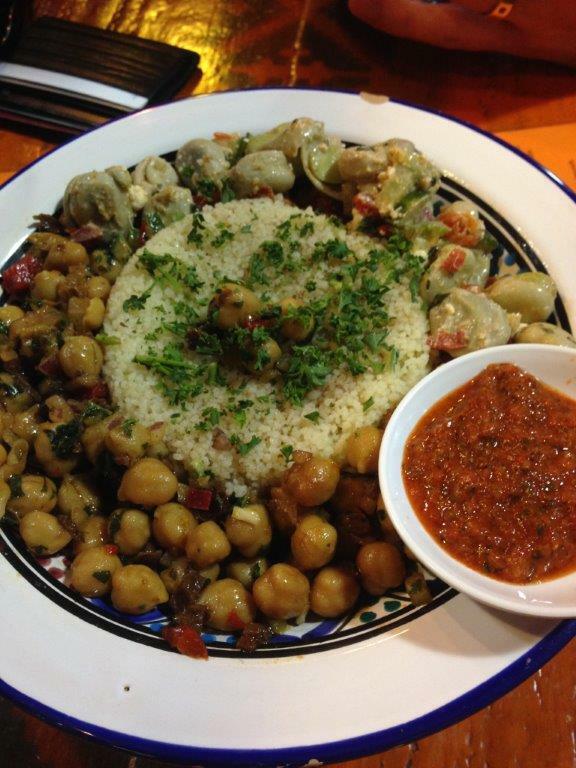 Le Souk make their couscous a little different to how we might at home. The couscous is twice cooked, over steam, for two hours each time. What results is the fluffiest couscous I've had. This method is the 15 hour slow cooked lamb shoulder version of couscous. The broad beans and chickpea salads that accompany the couscous are a welcome addition, giving the salad some different textures, acidity and spices. This would work well as a side to two lunch mains, or as a main on its own for a vegan / vegetarian. Whilst Amanda and I liked this dish, it wasn't a favourite of Mirko's as he would have liked some bolder flavours in this dish. Mirko and I finished off with a coffee. The beans are a special Le Souk blend. You can see from the picture, there was good crema, and the coffee had some nice acidity and fruitiness as it cooled in the glass. 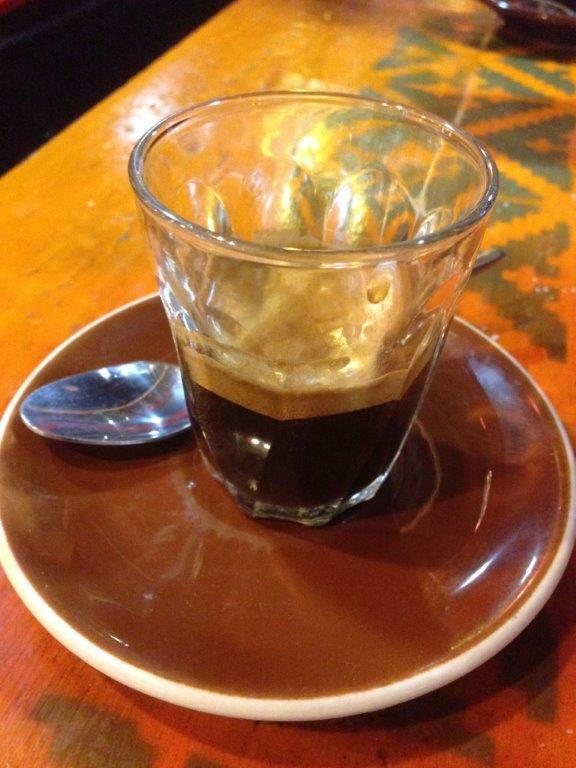 A good finish to the meal, and some caffeine to help us all stay awake for the afternoon! Vegetarian/Vegan Friendly: The menu has some great gluten free options, and a fair few salads that are vegan friendly. Child Friendly: A few options here for children too, only issue is the high seating stools. 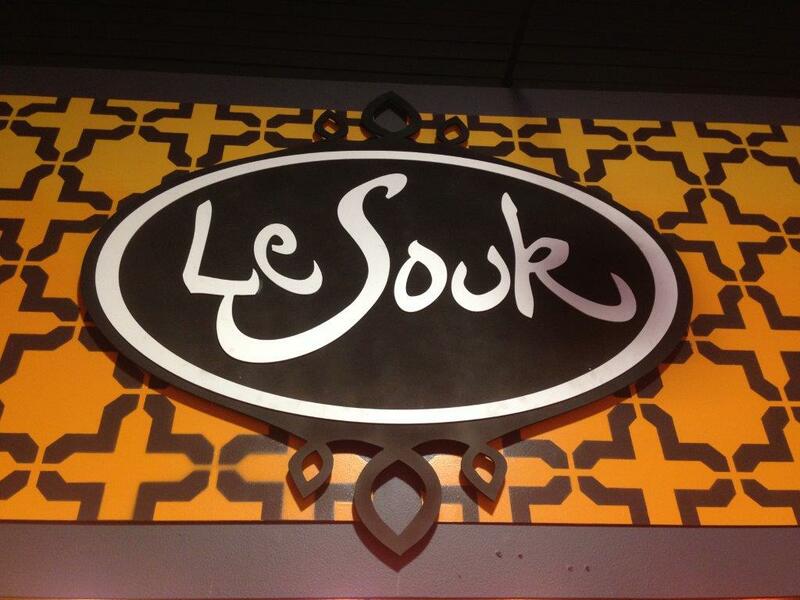 Le Souk is a great option for a breakfast or lunch, and the three of us agreed that we'll return to try some more of the menu. It's something a little different to the normal Asian around the markets (bar Lucia's), plus sitting in the markets eating is an experience in itself.